Why did thousands of people protest in Romania? The demonstrations are over a draft law being debated in parliament, which critics say would put the justice system under political control. This could hit the drive to root out graft in the country, which campaigners say is one of the most corrupt in the European Union. The most contested judicial changes include those to an inspection unit that oversees magistrates' conduct, the way in which chief prosecutors are appointed and the president's right to veto candidates. Who is behind this draft law? The ruling Social Democratic Party (PSD), who have set up a special parliamentary commission to discuss the proposals. PSD swept back into power with a strong majority a year ago, on a ticket of higher wages and pensions. That came a year after a PSD government resigned following protests over corruption in the aftermath of a deadly blaze at a Bucharest nightclub. The European Commission, foreign diplomats and thousands of magistrates have joined the protesters in criticising the proposals. Laura Kövesi, who heads up Romania’s anti-corruption directorate (DNA), told Euronews last week: “If voted through it will have a serious negative impact on the independence of justice and it will result in political control of prosecutors’ activity,. “It will lead to the political subordination of the prosecutors and could seriously obstruct the anti-corruption fight. “In my view the independence of justice is not a privilege for the magistrate - it is a fundamental principle in a democratic society. But critics of Kövesi say her anti-corruption drive has become a politicised witch hunt and worry of DNA’s alleged closeness to Romania’s secret service. The Romanian government said there was nothing in the proposals that would see the state taking control of the justice system. It added: “At the current stages of the debates and consultations in the parliament on the three drafts of law amending the laws on justice, it is rather difficult to talk about a final legislative solution for any of them, since they are ongoing. “However when discussions about affecting the independence of justice are being carried out in respect to the draft laws on justice, it should be important to point out exactly what the questionable provisions are. 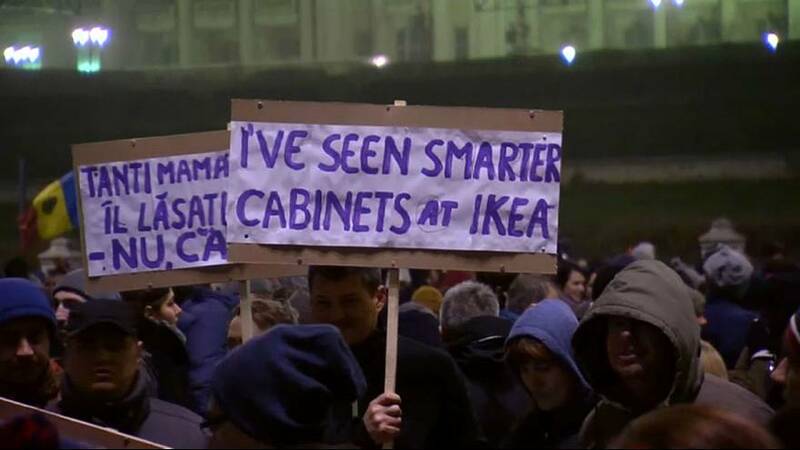 This isn’t the first anti-corruption protests in Romania, right? No. The country saw its biggest protests since the 1989 revolution after PSD tried to push through controversial anti-corruption reforms at the start of the year. It announced a new decree that would have decriminalised some corruption offences (abuse of office) that cause less than 44,000 euros of financial damage. But after the protests the government said it would withdraw the decree. That sparked the resignation of justice minister Florin Iordache, who had reportedly been the person who drafted the decree. Iordache is now heading up the special parliamentary commission looking at the controversial reform of the justice system.